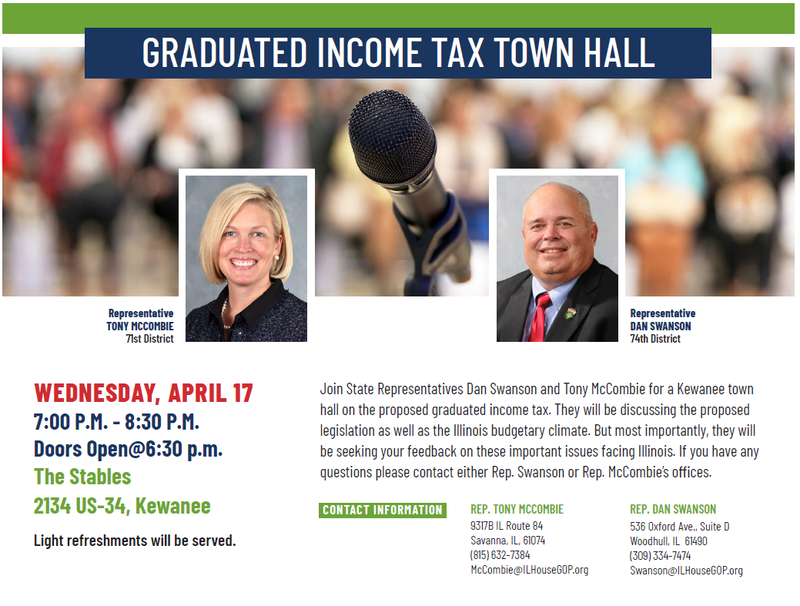 State Representative Dan Swanson (Alpha) announced he, along with State Representative Tony McCombie (Savanna), will be jointly hosting a Graduated Income Tax Town Hall Meeting in Kewanee the evening of Wednesday, April 17. The Graduated Income Tax Town Hall Meeting will take place on Wednesday, April 17 at The Stables, 2134 US Route 34, Kewanee from 7:00pm-8:30pm. Doors open at 6:30pm. Admission is FREE, families are welcomed, and light refreshments will be served. No RSVP is required. If you have any questions, please call Julie in Rep. Swanson’s Woodhull office at 309-334-7474 or Liz in Rep. McCombie’s Savanna office at 815-632-7384.